Industrial Optics Unlimited, Inc. is committed to improving our processes to better serve the needs of our customers. By working with many of our customers on JIT programs and Blanket orders we are able to offer great flexibility and cost effective pricing. Industrial Optics provides the following optical services: Precision Fabrication & Testing, Optical Finishing and Optical Thin Film Coatings. Specifically we offer the following processes: grinding & lapping, beveling, edging, generating, core drilling, shaping, slicing and pitch & pad polishing of most optical materials in both prototype and production run sizes. Custom sizes beyond standard range available. 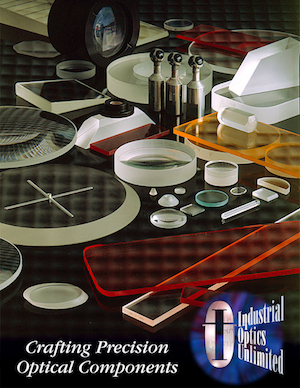 Industrial Optics can support your custom optical requirements at a competitive savings to standard catalog pricing while providing great quality and exceptional customer service.